Getting people to eat at least three healthy and nutrition-rich meals out of the 14 meals that they eat every week is a good enough beginning for us. And that’s exactly what we have seen is happening with the group of IT companies that are our clients," says IT professional-turned-entrepreneur Sunil Jalihal, who, along with a partner, is getting ready to launch what’s probably the country’s first branded salad and health fast food chain. What started out as a salad counter in the corner of an organic and natural bakery products store that he runs in Pune has now evolved into Deli.in, a smartly turned kiosk that churns out an array of organic and natural salads, sandwiches, juice and even ice cream to thousands of IT professionals at Infosys Technologies Ltd’s Bangalore and Pune (totally 30,000 people and growing) campuses, Wipro Ltd’s Bangalore headquarters, Persistent Systems Ltd, Convergys Ltd, and KPIT Cummins Infosystems Ltd, among others. With the brand now operating in 13 IT campuses and generating sales of between Rs1,000 and Rs8,000 per outlet daily, health food is providing healty profits for Jalihal and partner Rajendra Mishra, who founded Tenet Retail a couple of years ago with the intention of getting into high-end niche retailing in the food segment. “As lifestyles become increasingly stressful and people get caught in the rat race, health and nutrition are key elements that can help them remain healthful," maintains Jalihal, who says the brand is now ready for malls, railway stations, airports, where people usually grab foods such as samosas, pizza, or burgers. The brand made its first foray into a mall last week in Pune, and Jalihal says more than a thousand people have tasted his health foods. “Young mothers, people above 35 who are more heath conscious than youngsters, and a whole new breed of youngsters who work out at the gym and are high on health awareness are our potential customers," says Jalihal, who along with partner Mishra are investors in Sresta Natural Bioproducts Pvt. Ltd, a Hyderabad-based company that is into large-scale organic farming in Andhra Pradesh, and also owns 24 Lettered Mantra, a chain which is into retailing high-end organic produce and bakery items. The duo procured the master franchise for the chain two years ago and it was from here that Deli.in took shape. Having a stake in a company that is into organic produce is good syngery for Deli.in, which has a ready supplier base for all the organic and natural produce that it requires for its deli venture. The duo have already set up centralized kitchens for its bakery products in Bangalore and Pune, and will soon have similar facilities in Mumbai where it plans to start off tapping mall locations. A meal at Deli.in costs between Rs35 and Rs150. “Initially, the price seemed a little too much for me, but I realized, eventually that the health benefits of eating naturally grown foods outvalue the extra cost I incur," says 35-year-old Shilpa Parulekar, an employee of KPIT. Parulekar eats at Deli three times a week and says she feels good about the fact that she avoids the canteen’s staple thaali. 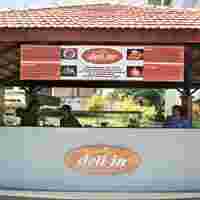 KPIT, which has two buildings housing more than 3,000, has introduced Deli.in in both locations. “The demand came from the staff after we introduced it in one building and at least 200 people eat there everyday," says Shekhar Sonphale, general manager, facilities management and commercial. Tenet Retail, meanwhile, is in negotiations with venture capitalists to fund its expansion plans which are, by no means modest, with plans to get another 100,000 people eating at Deli.in at campuses of companies such as Hewlett Packard, Intel, HSBC BPO and BMC Software. “We want to have 25 outlets across Mumbai, Delhi and Hyderabad in the next one year, in addition to our expansion in IT campuses," says Jalihal. Organized food retailing with 30% annual growth rate is the fastest growing segment of India’s retail industry, which is currently growing at 2-4% annually and expected to grow by 20% in the next few years. The organic food industry is growing at more than 35% in the US, while the rest of the food industry is growing at 2%. “While large retail food formats are focusing on conventional food items, the opportunity for specialized organic- food retailing, with its unique shopping and lifestyle experience, is well established as seen by the astronomical growth of Whole Foods in the US," says Jalihal.